Place eggs in single layer in 3-quart saucepan; add enough cold water so it is at least 1 inch above eggs. Heat to boiling; remove from heat. Cover and let stand 20 minutes. Drain; rinse with cold water. Let stand in ice water 10 minutes. Peel eggs; cut lengthwise in half. Slip out yolks; place in small bowl. Mash yolks with fork until smooth. Stir mayonnaise, lemon juice, onions, chilies and salt into yolks. Fill egg white halves with egg yolk mixture, heaping lightly. Sprinkle with paprika. To easily pipe the yolk mixture into the egg whites, spoon yolk mixture into a resealable food-storage plastic bag, seal the bag and cut off a corner. 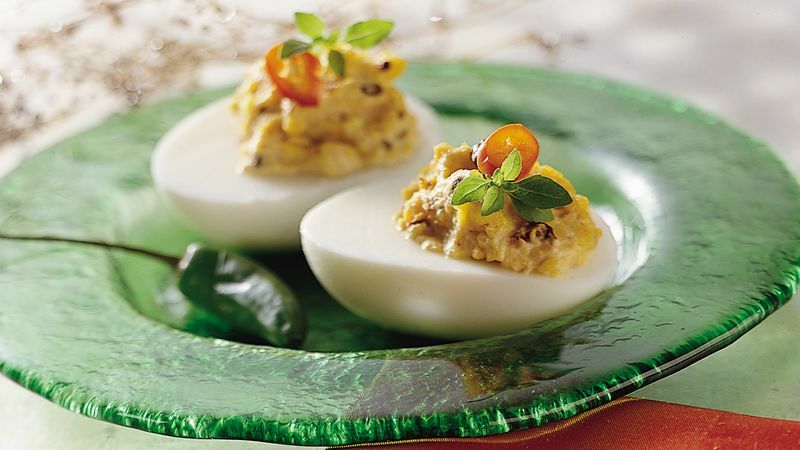 Place small flags in the eggs with pictures of chiles or words to indicate "hot" to your guests.